My friends why is that today we are in such religious confusion? Why is it that there seem to be more than one Jesus Christ being proclaimed today? And why is it that the message that Jesus Christ brought is not known today? And people believe exactly the opposite, and they can become very much riled up, and explosive if anyone tells them what Jesus Christ taught, what He believed, because they believe just the opposite. They are conformed to this world, which has a different doctrine today. Now I know that's about the most explosive thing that could be said. I know that that absolutely shocks many people, when they learn that what they have supposed is Christianity is mostly paganism. When they come to believe, or to see that, or be told rather, that what they believe is Christianity is exactly the opposite of that which Jesus Christ taught. So will you open your ears? Will you get your Bible, and open that too, and open your eyes and look in your own Bible? And we will see as we go through, that what Jesus Christ taught, what He believed, and not only that, some people will say, "Well, don't you know He was teaching the Jews back there? But, of course we're not Jews." Well you know, Jesus said salvation is of the Jew, but nevertheless, you will see that the words of Jesus Christ and the message He brought was the message that was accepted and believed by the Gentile converts. And by all of the Church, that is the Church that you find in the history of the Bible, in the book of Acts, in the epistles of the apostle Paul, and all the way through the teaching of Jesus is inculcated into that Church. And those who were Gentiles gave up their pagan ways that so many people believe today, and they believed the teaching of Jesus, and they followed the customs of Jesus. And today people will say, "Well I, I, — if you just show me that the Bible says these things — I, I, I, still see if all the people do this way, it must be right." After yesterdays program, we were seeing that Jesus said that He was to be "...killed, and after three days rise again" (Mark 8:31). And you can't get after three days from a Friday sunset, a so-called 'Good Friday' sunset burial, and a Sunday morning resurrection as the people have been believing. And I was talking with a man, who hadn't heard the broadcast, of course. Well, he said, "You could never make me believe that Jesus was any three days and three nights in the grave. Why," he says, "This tradition has been coming down for hundreds of years." He said, "These traditions that people have believed all these years can't be wrong." Well I said either they are wrong, or the Bible is wrong, and Jesus Christ is wrong. I showed him in Matthew 12:38-40, where Jesus said that He would be three days and three nights in His tomb. Matthew 12:38-40. Even though he saw it with his eyes, tradition couldn't be wrong. You know what Jesus Christ said? As I was reading it to you just a few days ago, of how they worship Him in vain, and teaching as their doctrines the traditions of men. And today men love those traditions. People today are conformists. Now Jesus was not a conformist. 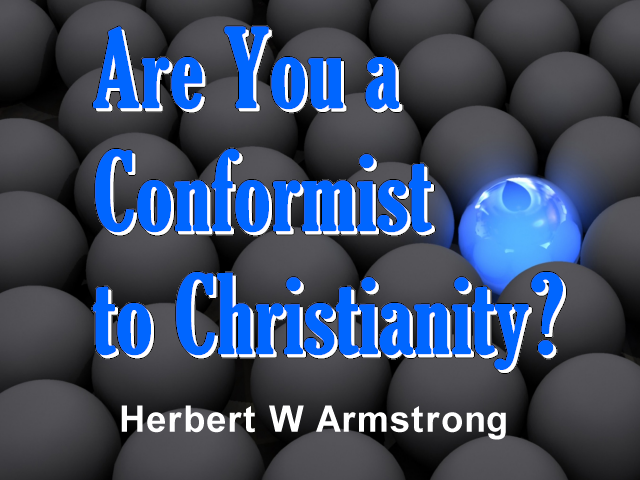 Are you a conformist? Do you believe in just conforming to this world and being just like other people? Most people do. There's a sheep instinct, it seems in us, if there is any such thing as instinct in human beings. And people want to be like other people. And people are so afraid of what other people would think. Well you know, those that followed Jesus had to brave what other people thought. He didn't teach what other people believed. He didn't teach the doctrines of the customary denominations of His day, and they had the denominations then, just the same as they do now. People don't want to do that today; they want to be conformed to the world. They don't want to present their bodies as a living sacrifice; they want to be like other people. And still they want to believe they are going to get to heaven and get in somehow. I tell you there is going to be weeping and gnashing of teeth and a lot of people are going to have a sudden dull headache, and a thuddy one at that, when they wake up and find how deceived they have been. I can say the same thing, as far as I follow Christ. And you check up, you be like the Bereans were when Paul preached. They didn't know whether he was a false prophet or a true one. There were many false prophets then, the same as there are now and they didn't know whether Paul was a false apostle or a true one. But they listened without prejudice (Acts 17:10-11). That's so hard to get prejudice out of the mind, isn't it, when we have been conformed. You know, my friends, the things you believe, you didn't believe them when you were born! You have grown up acquiring things because you heard them. Because you've become conformed and because the masses of the people have been, as Jesus foretold, as the apostle Paul said they would, as the Bible has prophesied — they have been deceived. And this whole world is deceived and believing wrong things today. There has to be a voice crying out in this wilderness for the people to open their eyes and come to a knowledge of the truth. Well there it is. How many people want it today? Well I hope you do. Someone has to talk plainly in these days in a mixed up world that is in such confusion, and with nothing but confusion of tongues. Everybody preaching something different, and nobody seeming to preach what Jesus Christ did. Now Jesus said He would be killed and after three days, rise again. After three days can't be one second less than three days and three nights. As Jesus said in Matthew 12:38-40, that He would be three days and three nights in the grave. Now other places He said the third day, that's true, and people go to that and they want to scratch out these other scriptures. You have to take all of those scriptures and put them together, if you want the truth. Now it had to be the third day, it couldn't get into the fourth day. And yet it had to be 'after' three days, and there is only one split second right in there. That is exactly the second that ends the third day and just before the fourth day begins. It can be in the third day and still be after three days, a period of seventy-two hours approximately had elapsed. And that is exactly when the resurrection of Jesus occurred. Exactly that amount of time after He was put in the grave. Now that was the only sign He gave that He was the Messiah. And I tell you people that don't accept that sign, do not accept the true Messiah, and they have another Jesus. Whether they know it or not, they may be sincere, a deceived person is usually sincere. Because, if he is not deceived, if he knows he's wrong, then he isn't sincere at all, and then he is just dishonest. The people are honest. The people mean right, they have just been deceived. If I thought I was talking to a bunch of you people out there all over the United States and all over the North American Continent, as I'm talking to right now, and if I thought you were just dishonest and wanted to be wrong, I wouldn't waste my breath with you. But I think you are honest people, I think that you are wholly sincere and I know you have been deceived. And I know that God loves you and that the truth is the only thing that will make you free. And unless your eyes can be opened to the truth, that you are innocent victims of what is a conspiracy, that came from a fifth column movement way back there hundreds and hundreds and hundreds of years ago, in the very first one, two, and three hundred years after Jesus Christ ascended to heaven, and when the Church started. Way back in the very beginning, is when the conspiracy of the fifth column movement from paganism came in to inject the pagan superstitions into what they called Christianity. And today we have been born in such a world, we have accepted it, we have swallowed it hook, line, and sinker. And we are good people, we are sincere people, we've just been deceived. And God loves these people and God wants us to come to see the truth. And it's the hardest thing in human nature to find that we have been wrong, and to find that we have believed wrong things. And to come to the place where we have that renewing of the mind to see the truth, and where we are no longer conformed to this world, but we give ourselves over to God, and our minds are opened, by the power of His Holy Spirit, the spirit of a sound mind, to come to see the real truth. You know, my friends, most of the things that have been revealed to most you, the things that you have come to believe, innocently and sincerely, are things that have been revealed by flesh and blood, by men. But, my friends, will we open our minds and our hearts to let God reveal His truth to us? Listen, I'm giving you the very word of God, will you open your mind? Will you open your heart and get rid of the prejudice? You know, if you have been right there, you haven't anything to lose. When you begin to search the scriptures with an open mind, and prove what is true, if you've been right, if I am wrong — you will come to see it. I'm not afraid of that, my friends. All I'm afraid of is prejudice. Prejudice that is blind, prejudice that like a dumb sheep wants to follow the other sheep to the slaughter. Prejudice that is not willing to open a mind and be RENEWED IN THE MIND, but insists on conforming like all the sheep that are on the way to the slaughter. Perhaps I should say the goats, I guess it is the goats that are going to the slaughter, but the sheep are pretty dumb. Now, so Jesus said that openly, and then Peter began to rebuke Him for it. Peter hadn't been converted yet. But, Jesus turning about, and seeing His disciples, rebuked Peter. And there He set an example, and you know, His ministers have to rebuke once in a while, and that's exactly what the apostle Paul said. In the writings of the scriptures, the people are told never to rebuke an elder, or a minister, and never to bring an accusation against them. But to entreat them as they would a father, and in love, and after a great deal of prayer, if they feel it's necessary (I Timothy 5:1). But the ministers are commanded to rebuke the people, and especially those in God's congregation (II Timothy 4:2). And Jesus here set that example. He rebuked Peter. Peter was out of line in rebuking Christ. His example while he was still unconverted is not the example for us to follow today. But the example of Jesus is the one for us to follow. Well that's the trouble today. They are minding the things of men, they are conformed to this world. THEY WANT TO FOLLOW MEN AND NOT TO FOLLOW GOD. If you are going to follow God, my friends, you'll be persecuted, you'll be very unpopular. Jesus said if they persecuted me, they will also persecute you. Have you suffered persecution for the belief of Jesus, for His doctrine, for His gospel, for the things He taught? Have you accepted them, have they become inculcated into your very life and a part of you, so that you accept them to the extent that it offends the world? The world is offended at the truth. Why? Because their deeds are evil. And they don't like to be reproved. They don't like to confess and admit they've been wrong! You have to admit that you have been wrong! You have to change your mind! You have to repent and turn around and go the other way, before you can even begin to be a Christian. That precedes even the acceptance of Christ as personal Savior in God's way of salvation. Now a lot of people are trying to get through in man's way of salvation, but there isn't any salvation in that. And I tell you that any church board or group of men, and I don't care who they are, I don't care how many theological letters they have after their names, they have no eternal life to give to you, my friends, only God has it. Eternal life is the gift of God, not the gift of men or groups of men or wrong theology. Now, Peter here was minding the things of men, not of God. How about us? Let's take that home and see where we stand. Let's each one of us look into the looking glass and see what we see. That means deny your ideas, deny what you have accepted. Deny all of these beliefs that you have just taken because others have them, because it's tradition, because the world goes that way. This world is going the wrong way. This world is unhappy, this world is wretched, this world full of suffering, and heartache, and headache, and worries, and fears and war and everything wrong. This world isn't going the right way, but God loves the world and He wants to save the world and give the world the truth. He just isn't forcing the world to come to it now, but He is going to in due time. Because Jesus Christ is soon coming again, and then He is going to enforce the very law of God and the way of God upon this world. By the Government of God which shall soon be set up in our time and in our generation on this earth. But we're still in that 6,000 year period that God Almighty has allotted to humanity to make its own decisions, to go its own way. To accept or reject the truth of God, to be influenced by the Devil or reject that. The Devil has no force of power to enforce it on anybody, and God will not, so you are your own boss and master, you can do as you please. But what we sow we shall reap, I hope you sow only eternal life and reap it. "If a man would come after me let him..." What? "...deny himself." Have you denied yourself? To what extent have you denied yourself? Have you denied yourself in what you believed, or are you just following the crowd? "...let him deny himself, and take up his cross..."(Mark 8:34), and it will be a cross if you follow Christ. Jesus said He did not come to bring peace but a sword and a man's foes will even be those of his own household, because they will turn against you, if you'll accept the truth (Matthew 10:36). Why that's all through the Bible. Jesus said that, here in Matthew 24, if you remember the prophecy of Jesus, and it comes down to our time. The very things that are coming upon us now, we are coming right into them. Even more of them than now, that's when the false preaching will be intensified. In the fury of their crying to uphold the ideas of men against those of God. "And because iniquity shall abound, the love of many shall wax cold." (Matthew 24:12) And so on, they'll betray one another. And other passages of scripture, other prophecies say that even the father will betray his children, and the children will betray their parents, if their parents are willing to accept the truth of Christ and to follow it (Matthew 10:21). They don't teach you follow Christ today. Now for instance, Christ didn't keep any Christmas or Easter, or New Years' or anything. But oh, we want to follow the pagans. Those are all pagan and all you have to do is look into any encyclopedia. I don't care whether it is Catholic, Protestant, or Jewish, I don't care whether it is irreligious or religious. Pick up any encyclopedia and look up the history of Christmas, look up the history of Easter, and you will see that they are pagan. New Years' today is a thing of man's invention. God set new years in the middle of the — right in the early spring, when life is budding out in nature, the old dead year is gone. The dead winter is gone and now a new life is springing out in nature, that's God's New Year's time. But men want, most of you heard that just this second for the first time in your lives, you never knew it before. We have gotten so far away from the ways of God. Man always thinks he knows more than God. Man has tried to change everything that God ever gave him, because the carnal mind is enmity against God and doesn't believe the ways or the things of God (Romans 8:7). Now, today they don't teach you follow Christ. I tell you today those that are professing Christians, don't follow Him. They don't observe the customs that He did. They don't do it at all, why they would be ashamed to, because Jesus kept the seventh day Sabbath. Jesus kept the Holy Days of God that are today spit on and sneered at, and called Jewish holidays. Let's not sneer at them, my friends, the Jews happen to be about the only people, except a few Christians, that have preserved intact those days of God. Jesus said, "...follow me" (Mark 8:34). Why don't you look into His life and see what He did and follow it. Oh we think well shouldn't follow that, we should follow what people think is the teaching of Paul. But you'll find that what Paul taught was exactly the same thing that Jesus did, and the example that Paul followed, exactly the same as Jesus Christ! You say, well I mentioned something here a minute ago, you say, "Didn't Paul observe Sunday?" No, he certainly didn't, he worked Sundays, and he preached on the Sabbath to the Gentiles always. And you can't find anything in your Bible contrary to that, anything other than that. Paul kept the annual Holy Days of God. He never observed any Christmas, or New Years', or Easter, or Halloween, or Saint Patrick's Day, or any of those days, not any of them whatsoever. But the apostle Paul observed the Passover, the apostle Paul kept the Day of Pentecost, and you can find it recorded in the book of Acts, where he did one year one place, another year at another. The apostle Paul kept the Feast of Tabernacles. He observed the Day of Atonement and the Feast of Trumpets. That's what the apostle Paul did and that's what he taught the Gentile Christians to do. Let's wake up and find out the truth. Well that's going to bring a lot of persecution, of course. People are so prejudiced against those things, because you have been taught that prejudice. And I tell you it started hundreds and hundreds of years ago. Because there were both Jewish and Gentile-born people that had accepted Christ and were Christians, in the first two or three hundred years after Christ. And a great jealousy came up between them. And so the Gentiles began to be envious of and jealous against the Jews and you even hear it today. Today it is generally believed that anybody who will understand the identity of our white English-speaking people as really the descendants of Abraham, Isaac, and Jacob through Joseph, Joseph the son of Jacob. That anybody that believes that is what they call today 'anti-semitic' and has a prejudice against the Jews. Well let me tell you, I have none. I have none whatsoever, I love the Jewish people just as much as I love any other people. I love them as much as I love the Catholic people and I love them as much as I do the Protestant people. And I love them all as much as I love the people that say, "I am nothing — I haven't got any religion." Because God loves them all and He taught us to have love for all men, and we are not Christians unless we do. You know actually the Jews didn't crucify Christ, let's get it straight. You and I crucified Him, because of our sins. I tell you the Jewish people never, and it was just a few Jews there at that time, a part of them right there in Jerusalem, anyhow, that were crying out for His blood. Of course they did, they said; "...His blood be on us, and...our children" Matthew 27:25). That is true, but Pilate was afraid of his own skin, and he's the one that gave in, and it was the Roman soldiers that did the actual work of the crucifixion. But, I'll tell you, all of that to the side, and notwithstanding they could not have crucified Jesus Christ. He would have escaped them, just as He did when they tried to kill Him time after time before that. His time hadn't come and He escaped, but when His time came, my friends, He went voluntarily to the cross. He did it of His own accord, of His own free will. It was a service that He volunteered to take for you and for me. Because you have sinned and transgressed against the Law of God. That's why He died for you. And you and I are the ones that crucified Jesus. Don't ever look at Jews and have a prejudice against them saying that they were the ones that crucified Jesus. Certainly it wasn't the present generation living today anyhow. "For my sake and the gospel's". Don't you see it is the gospel of Jesus that people hate? They have accepted Jesus as a person; they want to receive Him as a Savior. They want to profess that they believe in Him and accept Him as personal Savior, but they don't want His gospel. They don't want His message. They don't want the law of God, which He proclaimed! They want to claim He did away with the law of God. Well that's a different Jesus. The Jesus of your Bible, the Jesus of the New Testament said I have kept my Father's commandments (John 15:10). He said I have set you an example that you should do as I have done (John 13:15). And Peter said that we should follow His steps (I Peter 2:21) and here Jesus said, to "follow me, and take up your cross". And if you will lose your life for His sake and the gospel's, which is the message He preached, you will save it and God will give you eternal life. And Jesus said of such people, "I will raise him up at the last day "(John 6:39,40,44,54). Well there you are and that's the teaching of Jesus. Well I wanted to go further; we are coming now to this thing where Jesus said that there is some standing here that will never taste death until they see Jesus Christ at His Second Coming in the Kingdom of God in power and glory. How do you explain that? We are coming to that in the next broadcast of this series. Till tomorrow then goodbye friends.